Sometimes we roam Berlin’s streets and wonder – hey, where did that eatery go? Or – when did this restaurant open? And sometimes even – why is that man not wearing pants? Well, life is tough and not all questions are answered. But with Berlin being a fast-changing metropolis, always fixated on creativity, innovation and a generous dose of pleasure, new venues open on a daily basis. We compiled a list of the 7 hottest openings this autumn. Nestled between trendy Kreuzberg and upcoming Neukölln, Rusty is an unpretentious affair that’ll win your heart at first bite. It’s located in a former brothel gone steak house, so meat has always been on the menu. Rusty isn’t breaking tradition, but it’s changing the recipe. Instead of charging a small fortune for their delicious food, they serve affordable yet generous portions in a down-to-earth environment. Their credo? „From us, for you.“ Neukölln’s food lovers, watch out for this one! Golvet is an all new restaurant on Berlin’s culinary horizon and they’re already reaching for the stars. Michelin stars, to be precise. Chef Björn Swanson formerly cooked at Fischer’s Fritz (2 stars) and Facil (also 2 stars). Our first visit revealed perfect conditions for a stellar rise: mind-blowing food, perfect views over Berlin’s rooftops and a spectacular 13m bar counter. All the ingredients are in place. When the new Michelin Guide is released in January, we’ll see if Golvet can steal the show. Obey your MASTER.. MASTER! No, this is not a Metallica song. It’s our recommendation for your first visit to recently opened Meisterstück („masterpiece“) on Ku’Damm. They combine products from master brewers, master bakers and master butchers to masterfully pamper you. On top, more than 100 different beers and 18 tap beers are a promise for fun nights. Combine it with spares ribs and pastrami cooked 16 hours in the smoker and you’ll never want to leave again. Mivadu is a Vietnamese restaurant celebrating understatement in the heart of hipster hood (Rosenthaler Platz). Their focus is split evenly between authentic atmosphere and delicious noodle dishes. Mivadu is super affordable (mains around 8-10€) and is probably the single best Vietnamese restaurant in its price range. Swing by and try their Pho soup with spring onions, soybean and fresh herbs. It’s cooked to perfection and rounded up by tender rare beef. Newly opened boutique hotel The Yard is a green oasis with a generous garden and a lush terrace designed by star architect Enzo Enea from Zurich. It’s located in a low-key street in busy Kreuzberg, which makes it the perfect getaway for urban explorers. Given that the urban explorers manage to escape the 13 meter pool. Once on the street, you’ll discover one of Berlin’s most vibrant yet raw neighborhoods. Expect a young crowd, rough edges and the perfect hotel for you urban explorations. Timber Doodle… isn’t that a bird? Well, yes. Now it’s also a Berlin-based bar. And what happens when a bird turns into a bar? Easy. The drinks give you wings! Owner and bartender Susanne Baró Fernández has refined her mixing game in Ritz-Carlton’s Curtain Club. She combines self-made syrups, essences from herbs and flowers and rare liquors to create unique cocktail blends. For her, the drinks come second. Number one priority: happy guests. Sounds like something we can get behind. A new concession, water damages and never-ending bureaucracy. It’s been quite a ride before Stairs Bar could finally open in early August. 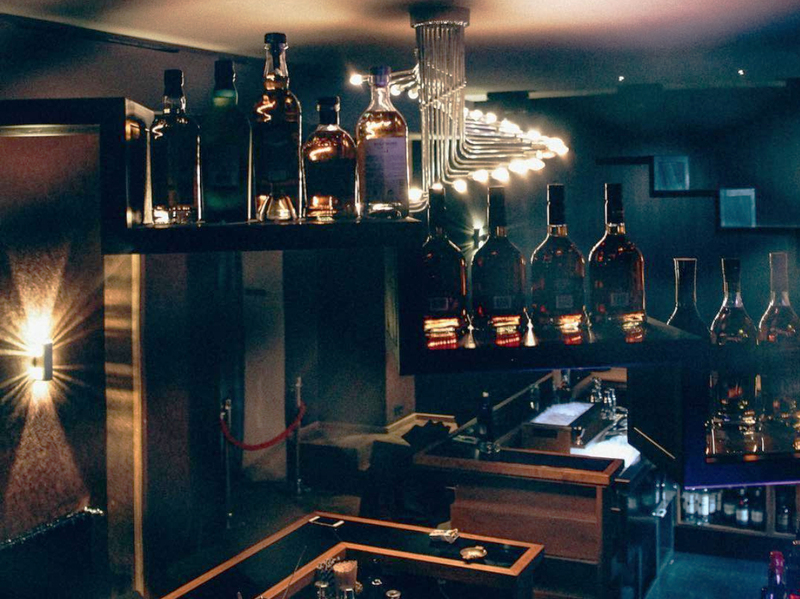 The result is an avantgardistic bar with a low-key, speakeasy attitude in the heart of West Berlin. Despite the lack of hype, there are good reasons to visit. They serve all their drinks in three versions: original, with a classic twist and with a modern twist. For example: Manhattan, Brooklyn and Womanhattan. The last being a wild mix of PX Sherry, peach wine and Jura Diurachs‘ Own whiskey. Drink all three in a row for perfect happiness. When a Berlin nightlife venue closes for good, we usually sob for days. But the sobbing doesn’t always last. Event location and club Chaussee 131 has risen from the ashes of Larry Bar and it’s even better than before! Without putting up much effort, it’s becoming the new place-to-be in Mitte. Expect excessive parties on Fridays with DJs from former King Size, Bar 25 and Anita Berber. Cool people, edgy location, good drinks. Who was Larry Bar anyway? Article posted in THE SCENE and tagged chaussee 131, golvet, meiststück, mivadu, rusty restaurant, stairs bar, timber doodle on 9 October 2017 by Jan Czyszke.